Last month, we talked about incredible ensembles of warrior armor used from Bronze Age to the Medieval period. 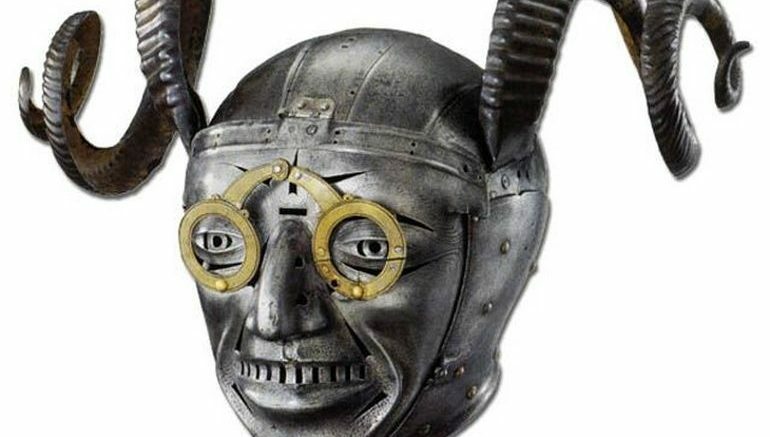 But while most of those sets were used in actual battle scenarios, we are now witness to the bizarre looking horned helmet of Henry VIII, a piece of armor that goes beyond all bounds of practicality. The reason for that perhaps has to do with the fact that this hornet helmet (or armet, since it protects the entire skull and face) was not used as battle gear, but rather flaunted as a show piece in opulent parties and ritzy pageants. 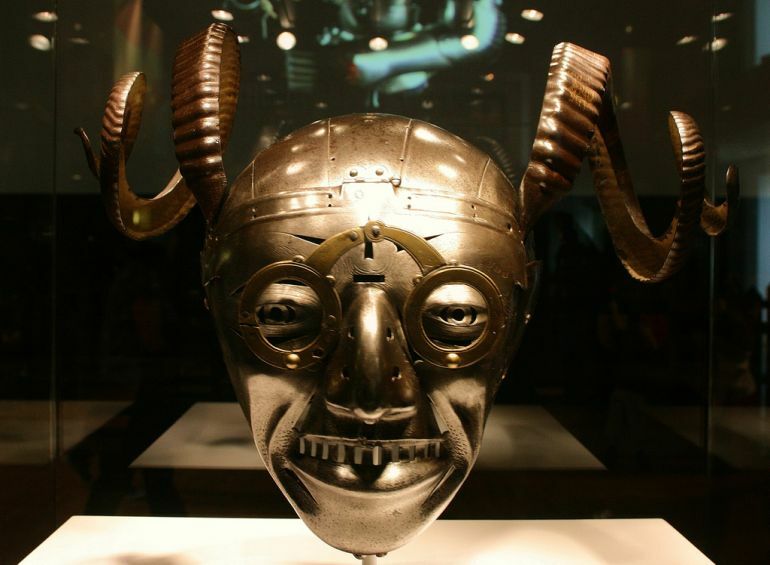 To that end, the outlandish yet marvelous horned helmet was actually gifted to Henry VIII by Holy Roman Emperor Maximillian I, in 1514 AD. The armet was just one part of an entire armor ensemble, created by Innsbruck-based Konrad Seusenhofer, who was one of the leading armorers of the era in Medieval Europe. In that regard, beyond just the whimsical visual element of this armor piece, the intricacy of the object stands testament to its exquisite craftsmanship and ergonomic bearing. Pertaining to the latter, this armet was among the very first specimens to completely enclose the head portion while still being compact and light enough to be worn by a user in dynamic motion. Unfortunately, the rest of the armor set didn’t survive, possibly after being destroyed and sold as scrap during the tumultuous epoch of the English Civil War. Interestingly enough, it seems that even Henry VIII was inspired by the incredible craftsmanship of Seusenhofer, so much so that the monarch, not to be outdone by his continental European peers, set in motion a plan to gather the best armorers available from Germany, Flanders, and Italy. These master craftsmen were given the resources to set up their workshop inside the premises of the king’s palace at Greenwich. Over the eyes are bolted a pair of brass spectacle frames, the right eyepiece mended with rivets at either side (with iron patches at the back) and at the join of the frame. The mask is etched with a similar border to that of the skull, though slightly cruder in execution, and is humorously etched with stubble, eyebrows, shading on the lips and creases at the corners of the eyes. It is not a flattering image, and is believed to depict the fool, a popular figure in court pageants, hence the wrinkles, stubble, dripping nose, etc. There has been much debate as to whether the horns and glasses are original or later additions. 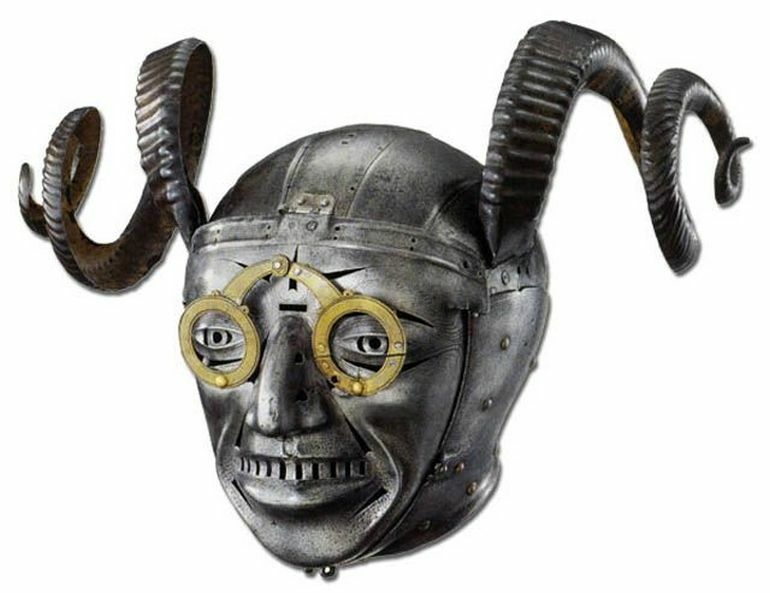 Henry VIII may have occasionally worn glasses like these, but probably not horns, as this was the sign for a cuckold. Basically it is a bit of an enigma with scholarly debate still raging! Hope that helps a little – though it’s still a mystery. Furthermore, the back section of the helmet still retains the holes made for attaching silver-gilt panels and a vibrant purple velvet headpiece. 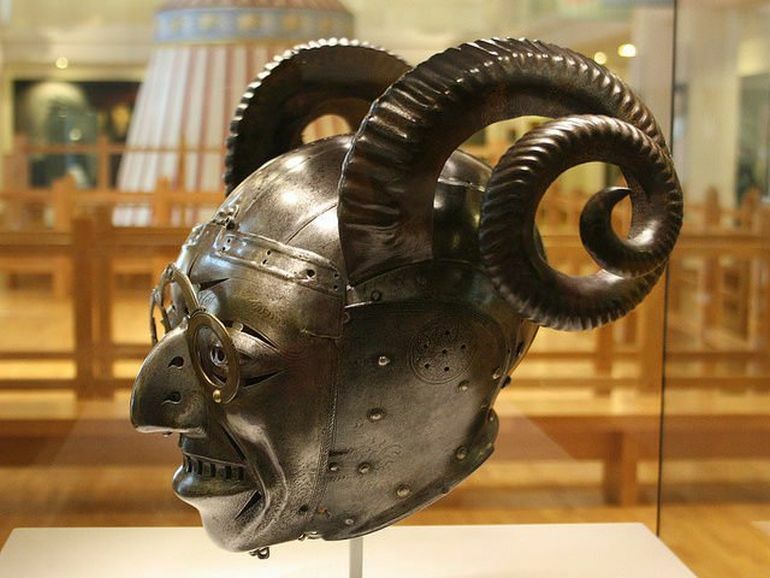 Considering such an eccentric, gaudy combination, almost bordering on the comical, initially for many years scholars misidentified the horned helmet as a prop used by Henry VIII’s court jester Will Somers. And thus the questions still remain – why would a respected monarch present such an exquisite yet (possibly) ‘mischievous’ gift to another powerful monarch? More importantly – why would the latter (known for his haughtiness) accept such a gift that potentially parodies his personality or status?